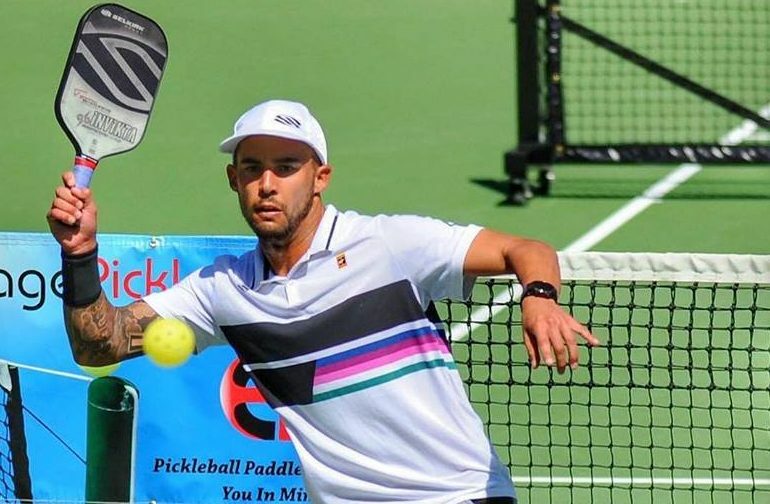 He’s become the new face of pickleball, a fast-paced sport that’s growing in popularity nationwide. 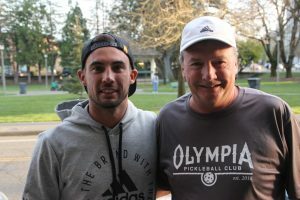 Tyson McGuffin, the top ranked pickleball player in the world, shared his story and – to the delight of 25 people – some tips on how to play the game in his recent visit to Olympia. The listeners – who were from the Olympia Pickleball Club – were certainly listening to the right guy for tips. Last year, McGuffin went 48-2 in his pickleball matches, winning two national championships in singles and one in doubles, earning him his top-ranked ratings. This week, he’s busy defending his title at a national indoor tournament in Centralia. It’s been an interesting journey for McGuffin, who lives in Coeur d’Alene, Idaho. Getting to a top-ranked rating in the world took some side trips. While growing up in Chelan, wrestling seemed to be his calling. His father was a wrestling coach at Chelan High School and he encouraged takedowns, not forehand winners down the ally. McGuffin began playing tennis when he was 14. He wrestled through high school, qualifying for state three times and learning about takedowns and the importance of hard work. But he was more interested in swinging a racquet across the court than tossing a body onto the mat. But that’s not to say that McGuffin regretted doing what his father encouraged him to do – wrestle. There were some important takeaways, some important life lessons that he learned wrestling and that uses today. And to be a top-ranked pickleball player, you have to be a committed and determined player, someone dedicated to training, working out, and practicing hard. It’s been a sudden climb to the top of the pickleball world for McGuffin. About four years ago, McGuffin was a professional tennis player, struggling and training to get ranked. But after a friend injured his shoulder playing tennis and started playing pickleball, McGuffin followed his friend’s lead and gave pickleball a try. Within a year from when he first starting playing pickleball back in 2015, McGuffin placed second at nationals. He hasn’t picked up a tennis racquet since. 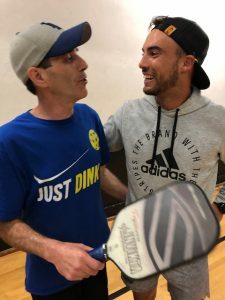 Last year, Selkirk Sport, a leading manufacturer of pickleball paddles, signed McGuffin to the largest endorsement contract ever in pro pickleball. The paydays have arrived. And there’s potential for bigger paydays as pickleball continues to grow in popularity. Recently ESPN signed a contract to telecast a couple of national tournaments each year. That translates to bigger paydays for the players. The switch from tennis to pickleball was seamless for McGuffin. Besides learning the new swings, he found a new crowd of players. Back when McGuffin was trying to make it as a pro tennis player he had a conflict between the time he needed to spend training and the time he needed to spend earning a living. 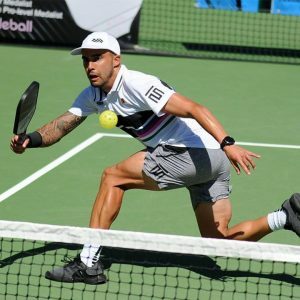 Now, in addition to traveling the country to play in tournaments, he’s also working for Level Up Pickleball Camp, which hosts camps across the country. But that will change as the sport continues to grow in popularity and that dangling payoff for winning a tournament will continue to grow. That will draw more and more talent. McGuffin, who is a four-time national champion, is again the favorite going into the Centralia indoors championship. He’s won it the last three years. Fans can follow McGuffin on his website, and on Facebook and Instagram. And because of Stephens, many pickleball players in Olympia got a chance to meet the sport’s biggest star. When Stephens heard that McGuffin was going to compete in Centralia again, he reached out to McGuffin’s agent and invited him to come. That’s just Stephens being Stephens. He’s all about making the best of the moment. And that’s the theme and motivation behind him starting the Olympia Pickleball Club in October last year. It’s about giving people – young and old – an opportunity to get out and exercise and socialize. “It’s all about having fun,” Stephens said.